↑ "'I just couldn't do it anymore': Gwyneth Paltrow on why she split with Chris Martin and how she's given up on trying to prove herself". TV & Showbiz - Daily Mail Online. January 2, 2015. 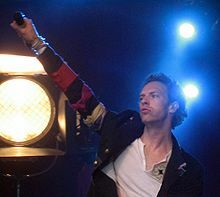 ↑ "Chris Martin & Gwyneth Paltrow are officially divorced". Glamour UK. July 16, 2016. หน้านี้แก้ไขล่าสุดเมื่อวันที่ 28 พฤษภาคม 2560 เวลา 00:37 น.